47-year-old Laverne Russell is in need of your help. An amputee, Miss Russell, who is now staying at Mt. Salem, lost her right leg 2 years ago, after complaining of feeling pain. The amputation of the leg has left her without a job, making it difficult for her to fend for herself and her ten-year-old daughter. Russell has resorted to begging in the streets because her disability has made it difficult for her to secure a job. Russell related that the life changing moment came one day when she was at work at a restaurant in Mt. Salem and felt a pain in her leg. She stopped for a while to tend to the pained area and then resumed working. The pain continued to affect her but became overwhelming for her one day while she was at work, and she took the time off and went to the hospital. The doctor at the hospital told her it may be an abscess (an abscess is a collection of pus that has built up within the tissue of the body). She was told to return the following day, which she did. Miss Russell said a doctor gave her an injection in the leg and some medication. “The medication did not work and I began to feel more pain. 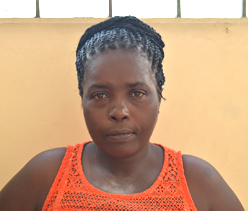 I went back to get some treatment because the pain was becoming unbearable,” she related. Miss Russell indicated that while no X-Ray was done, a doctor Plummer at the Cornwall Regional Hospital recommended that the leg be amputated because the flesh was decaying (rotting). According to her, the pain was so unbearable, and it was a very difficult decision, as it would rob her of her mobility. She could take it no longer and trusting that the doctor knew what he was doing; Miss Russell acted on his advice and agreed to the amputation of the leg. So now without a job, she is forced to beg on the streets. She says her heart is bleeding because after losing her leg, her life was again changed for the worse as her 10 year-old daughter was also taken by the authorities and placed in a home in Mandeville and is now a ward of the state. “That was so painful, still is but what can I do?” she said with tears welling up in her eyes. “I don’t have a job. I cannot get a steady job to earn any money for myself so I am forced to beg. I am staying with a friend and am grateful but I cannot continue to depend on that friend. I do not want to impose on them too long,” she added. Miss Russell is now pleading for your assistance as she requires a prosthetic leg to restore some level of mobility. The leg costs approximately $ 125,000 and she does not have the money to buy it. “I need all the help I can get. I don’t have the money to buy the leg so I am asking members of the public to help me. Please, I am desperate. I would like to be able to fend for myself,” she pleaded. “I would need this leg but I cannot afford it. It would help me to move around and possibly get to work again” she explained. So, anyone with a heart and the means to help may call her at 452-1284 to offer some assistance.